The Peter O'Toole pix is a rare beauty. Captures him exactly the way one would think he would like to be seen--regal, elegant, a bit snobbish yet showing a faint vulnerability, and detached from most mortals. You are an excellent photographer. I am looking forward to seeing more of your work on this site. Two terrific stories. Caught and held my attention all the way through - and I laughed out loud at the Russian phrase. Getting the inside scoop on life in the photo pool is great. With a wee bit of polishing, you have some classic anecdotes here. A sensible editor will jump at it, if one hasn't already. "Lawrence of Arabia" is my favorite movie of all time. Pete O'Toole is a genius in my book. Loved the photo and the story. Oh man... You are an amazing photographer. I can't wait to get home from work so I can look at more. 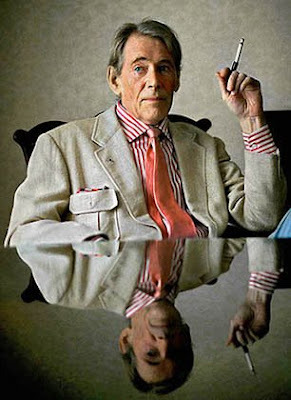 You captured the very best of Peter O'Toole. It makes me want to go back to smoking. Damn. Ken Newman threatened knee-capping if I didn't provide some input to help you make some editorial decisions. Listen, you don't need nor want my help. Your work is wonderful and I enjoyed reading every article and viewing each image. My favorites: Palin, Eastwood, and O'Toole. The eventual book will be a smash! I really enjoyed this! Thanks for the glimpse of a very eccentric man.